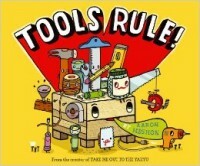 Altpick.com : Library : TOOLS RULE! Calling all tools to the workbench! Aaron Meshon’s follow-up to Take Me Out to the Yakyu, which The New York Times Book Review calls “a definite home run,” hits the nail on the head. In a messy yard, a busy day begins for a team of tools. With a click, click and a bang! bang!, everyone from Wrench, Hammer, and Screwdriver right down to Nuts and Bolts is pitching in to make a shed. Okay, crew! Who’s ready to build? From “hammer” and “wrench” to “awl” and “vise,” readers will construct a vocabulary of terrific tool terms as they learn the importance of teamwork.